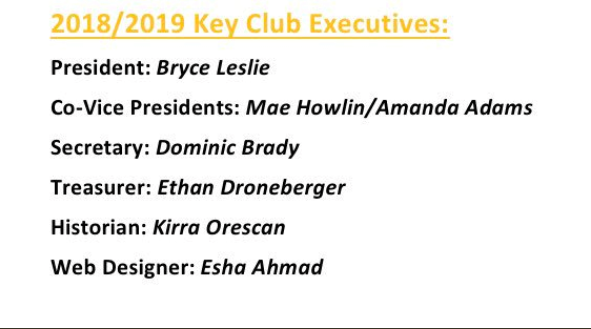 Welcome to the Northern High School Key Club Weebly Page! We are a service-based club motivated to make a difference in the Southern Maryland Region. Stay up to date on both past and upcoming meetings, projects, and fundraisers right here! Make sure you are at next week's meeting to receive important information on our end-of-year project June 15th. Our executives are also working on a fundraising event in the summer to prepare for both this project and for future district events. Key Club's 93rd birthday is today, which means it's Eliminate Week! Read it, learn about it, make a difference! Bring your friends to the next meeting. Let's finish this year out strong and focus on recruiting dedicated members ​​to be apart of this awesome club's growth! Thank you for all that you do in our community!